The small letters in the margins are the Marginal Notes. 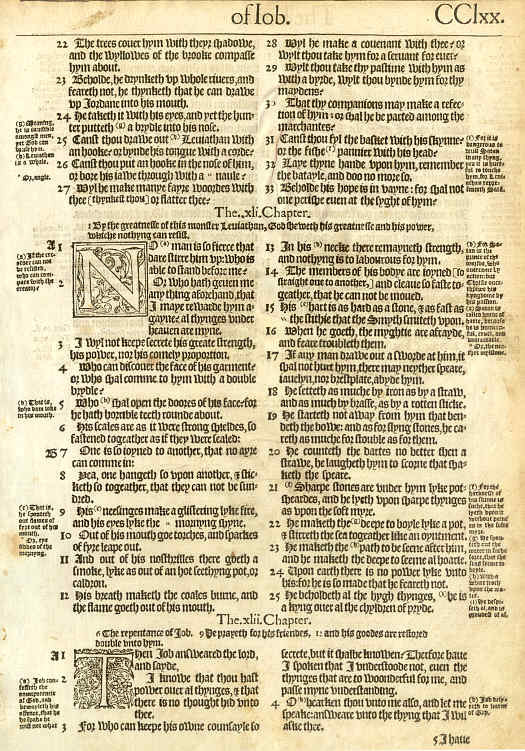 Most of them came from the Geneva Bible, except those that the Editors found offensive — and that was plenty of them, due to the fact that the editors of the Geneva Translation were Protestant Reformers. The Bishops' Bible was to be a revision of the Great Bible. One thing that the Bishops' Bible retained was the Great Bible's size. This page is 10-inches by 15-inches, which made for a large, impressive volume. In the lower right corner of the page, note the words (hard to read -- you have to look close) "5 I have". These are the first words on the next page — verse 5 which begins: "5 I have heard of thee ...". The idea was to help those that read the Scripture aloud; these extra couple words at the bottom of the page were to help smooth reading while turning the page. This practice was common in books of the 16th and 17th Centuries. As is typical in many works of the time, the letter " J" (which was absent many old Roman alphabets) is replaced with the letter "I". According to the top of the page, this is from the Book "of Iob". Use the Menu on the left to view a closeup of another page from the Bishops' Bible.